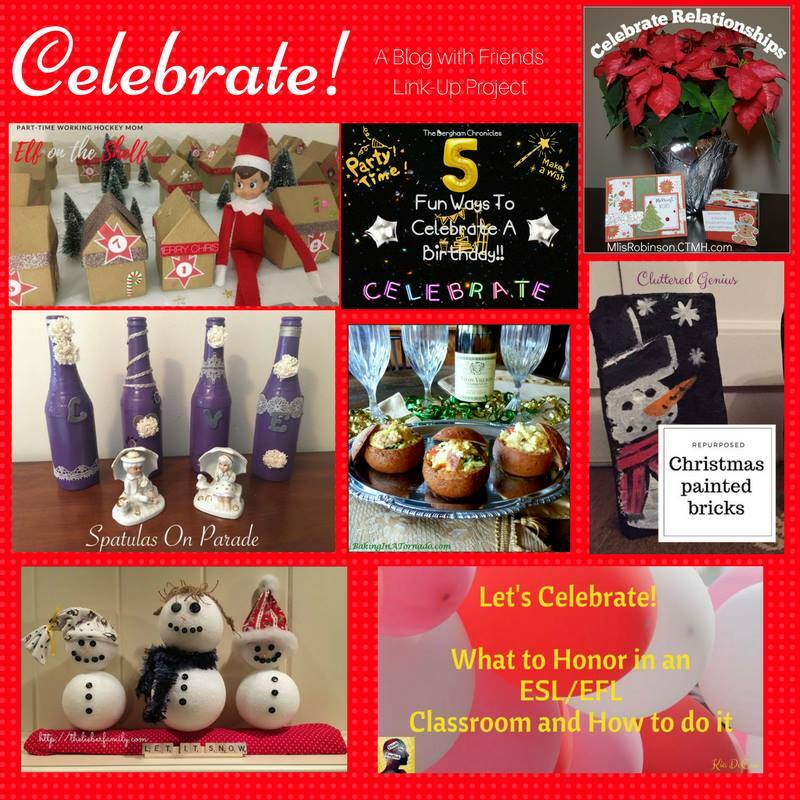 In-Person & Remote Greeting Card Classes (Clubs) in 2018! Many people have been asking me for card clubs and I am starting something new in 2018! You can either choose to participate in a club or opt-in to participate each month as you choose. All the details are below so keep reading. 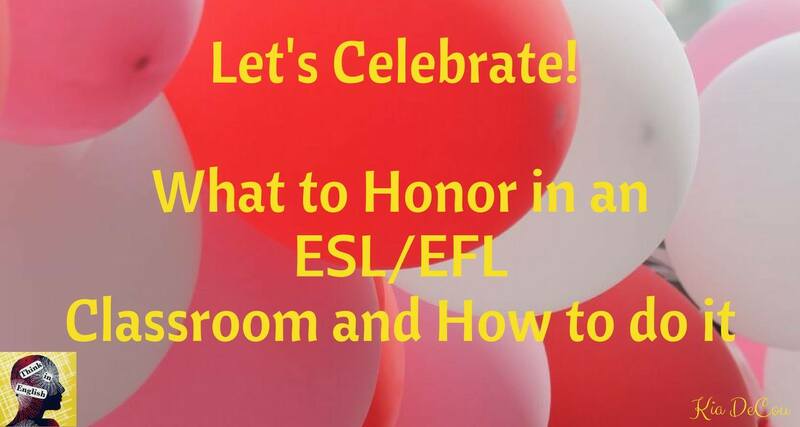 Then, contact me with your selection by January 8, 2018 and we will get the fun started! What will the card kit include each month? 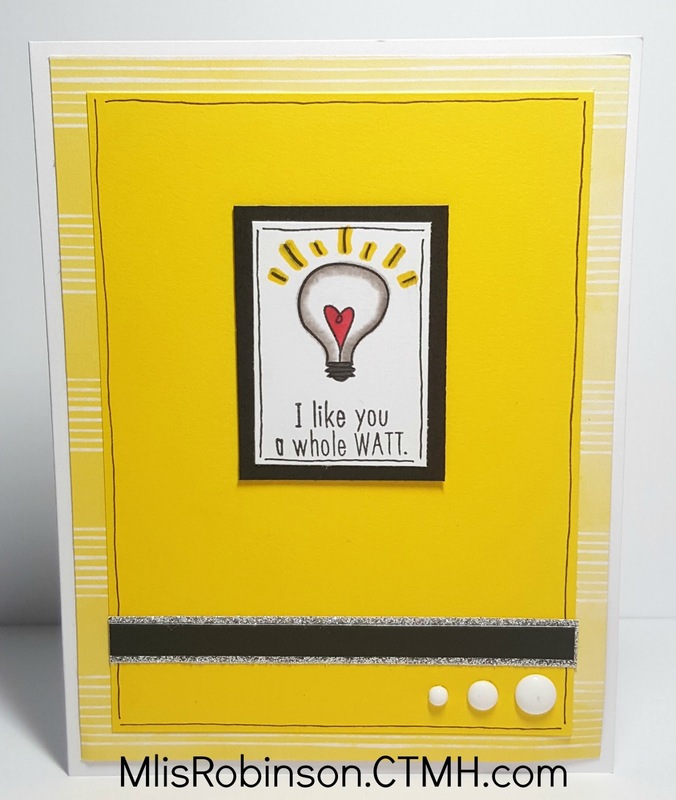 Each month you are guaranteed to create at least three cards of varying themes. There will be times when there is a bonus project (or two) thrown in. 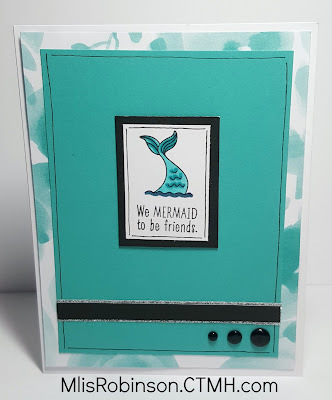 We will use different stamp sets, techniques and embellishments. 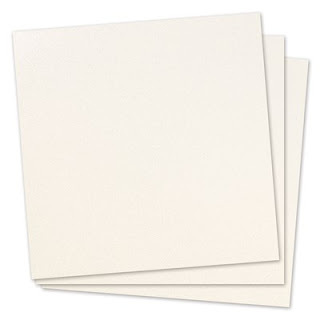 You are asked to provide your own adhesive (various types will be used in card design), or you can elect to purchase them from me, scissors and other basic supplies. Envelopes will be included. 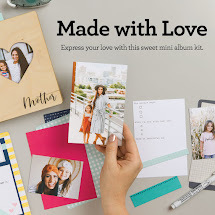 · For remote participants, the card kit is $8, includes shipping to your door, pre-stamped images, and full-color directions for easy assembly. You can get the kit FREE with a $30 purchase (before shipping & tax). Payment for either option must be made at the time of RSVP. Get the Most by Joining a Club! 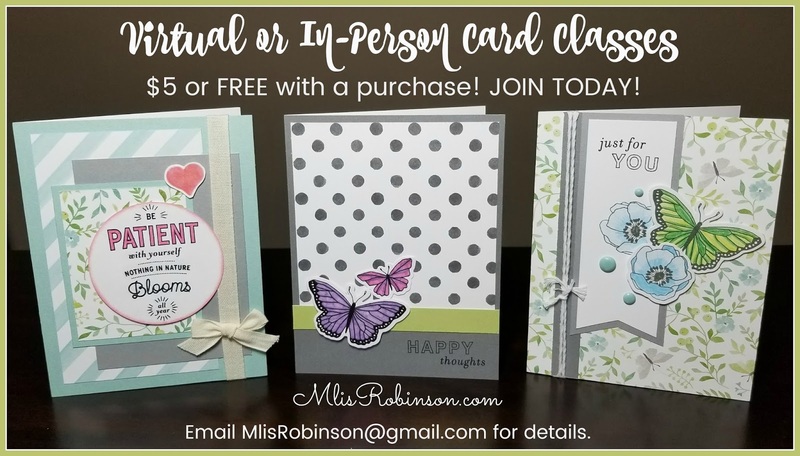 Commit to participating in the card class for five (5) months, January – May 2018, purchasing at least $30 each month and you will get a minimum of $25 in FREE products one of those months. 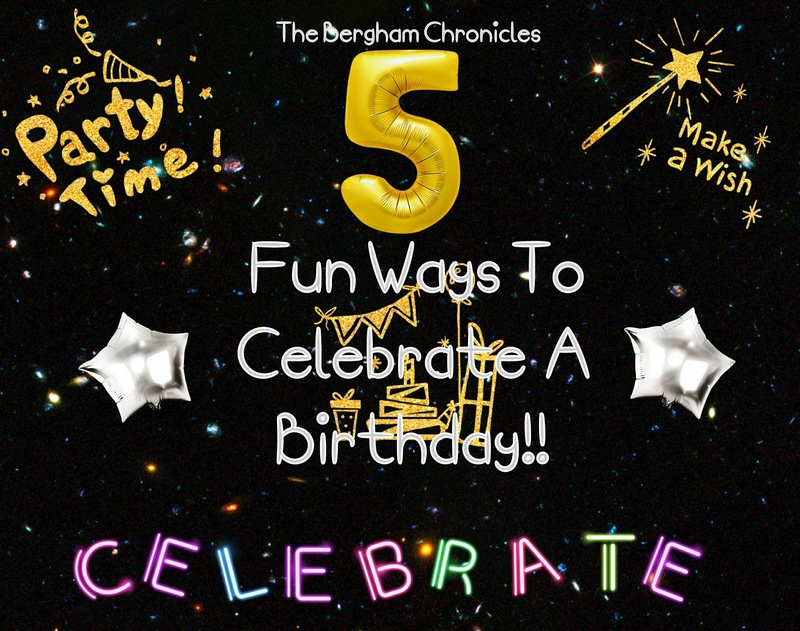 (Each of the five persons in the club will take a turn.) 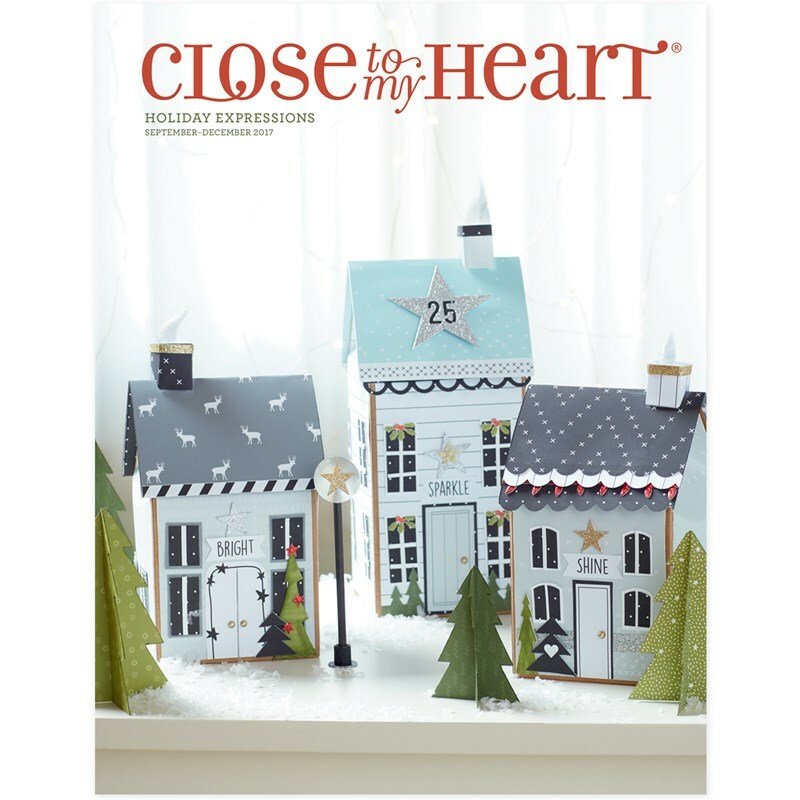 You will also receive special goodies from me as a “Club Member” to include a copy of our NEW Seasonal Expressions Idea Book, exclusive stamp set, and more! What can you purchase for the minimum $30 requirement? Anything you want. 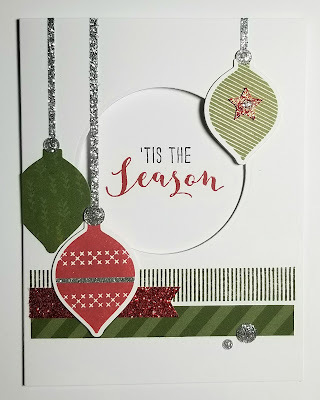 J I will provide a supply list for the cards we make each month should you want more of what we used or you can get whatever your heart desires. To get started, please contact me by the end of January 5, 2018 with your selected interest. At that time additional information will be shared based on what option you choose, when the group decides to meet, etc. There will be a required purchase before the end of January 2018. If you would like to discuss further options or details, please let me know and I’d be happy to do so. I’m excited about this opportunity to serve your card-making interests and want everyone to benefit! Please consider sharing this with anyone who you think may be interested. 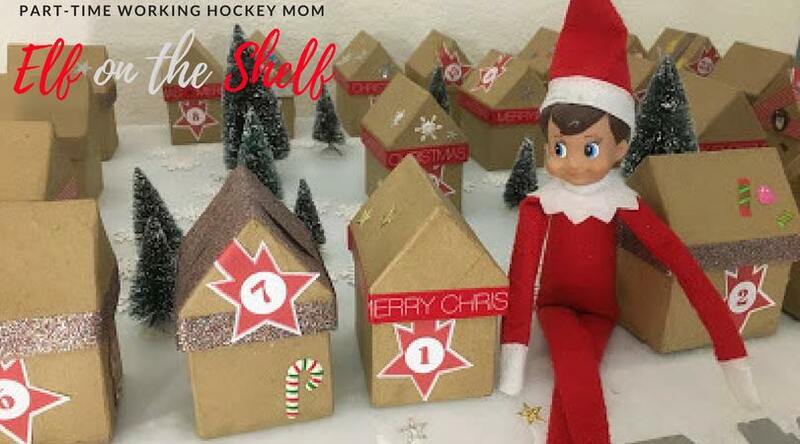 Say Goodbye to Holiday Products in Four Days! 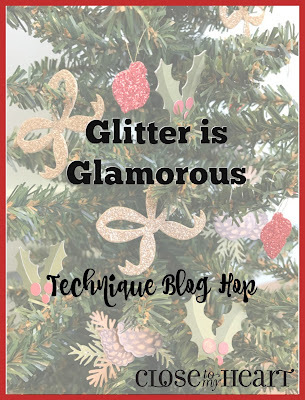 Unfortunately, it's that time of the year when we say goodbye to some fabulous, holiday-related products. December 31st marks the end of the life of the Holiday Expressions Idea Book and the photographed Silver & Gold Collection seen above. The same holds true for the Beary Christmas Collection and quite a few others to include Halloween and Thankgiving-themed products. 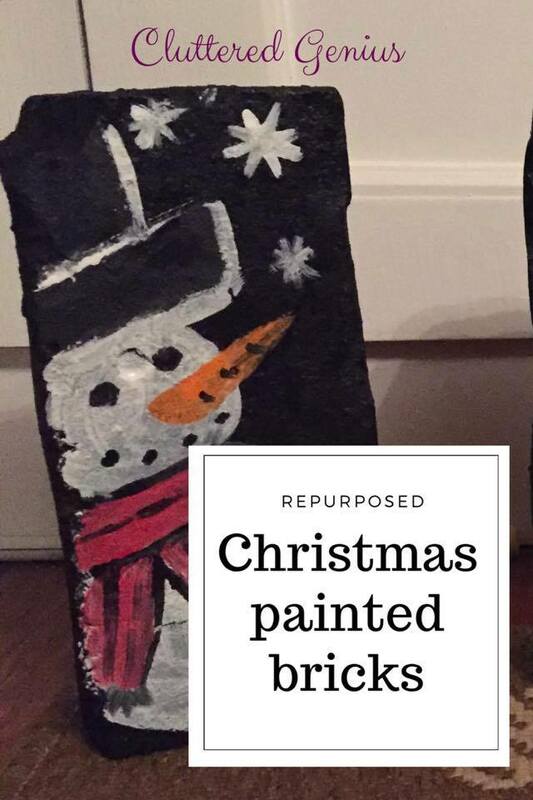 In fact, a lot of the Beary Christmas Collection is already unavailable because it was well-loved. Be sure to check out what's included in the Holiday Expressions and check out the Going Soon! area of my website that includes some other items. Some of these products are my favorites and it's going to be hard for me to see them go. Need Another Tax Write-Off for 2017? 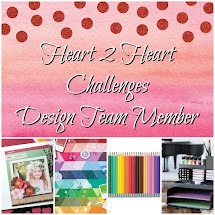 There are many benefits of being a Close To My Heart Consultant and a member of my team. However, at this time of the year there is probably one reason that jumps to the top of the list and that is...getting NEW PRODUCTS before they are released to the general public! As a Consultant, we get products approximately one month before they are released to others, giving us an opportunity to order, create, and prepare for our upcoming events. 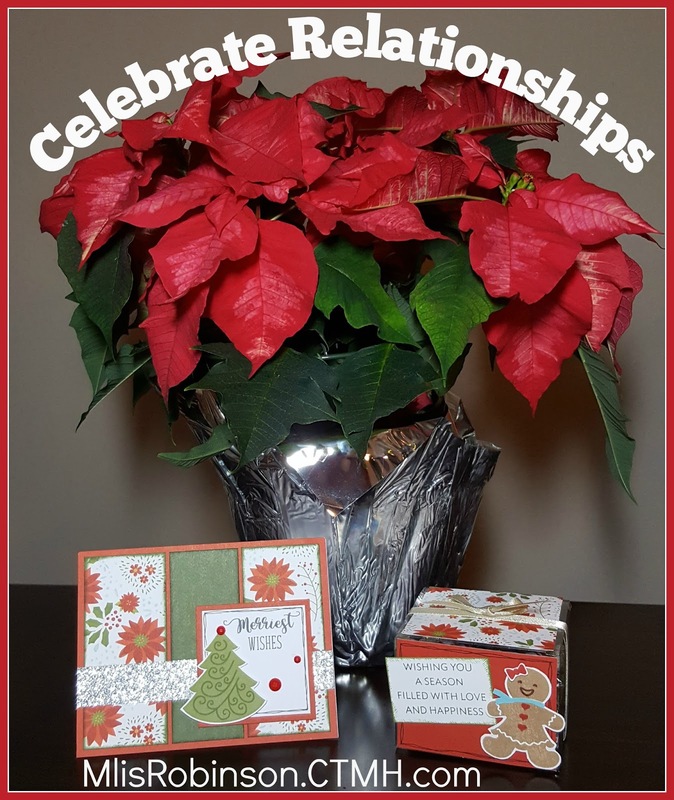 We received a copy of this beautiful Seasonal Expressions I Idea Book (valid January - April 2018, while supplies last), on December 2nd. It will debut on January 1, 2018 - a wonderful way to welcome in the new year. Did you know we also get to write-off all business-associated expenses? That means products I purchase and use in my business, photo-printing, registration and attendance at events are just a few examples of related expenses. New Consultant Kit full of product valued over $200! 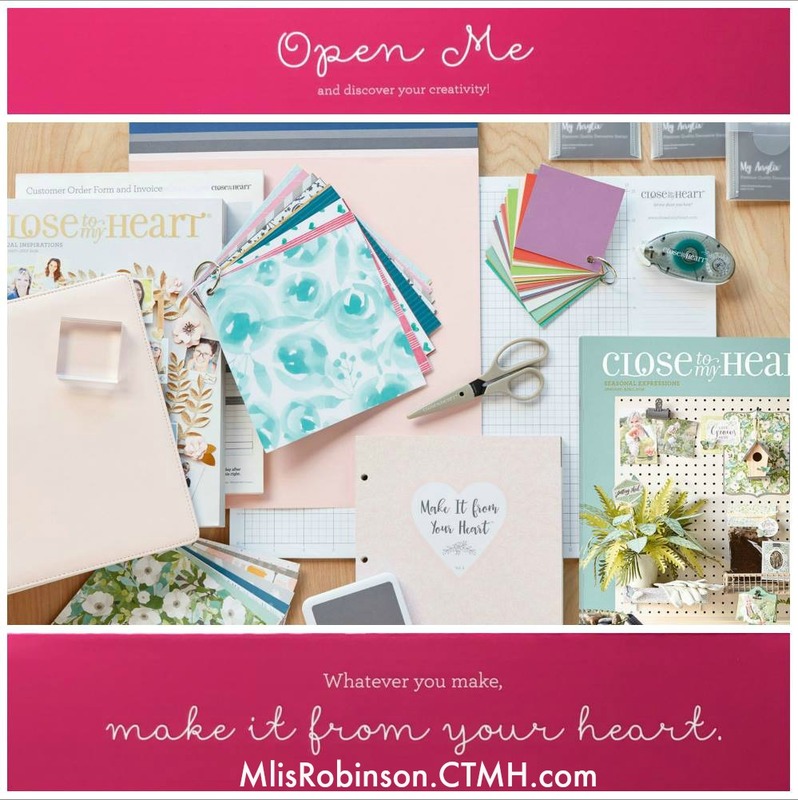 Opportunities for other exciting incentives, like trips, crafting products, and more! If you have any questions regarding the Consultant opportunity, please contact me. I'm happy to answer them. 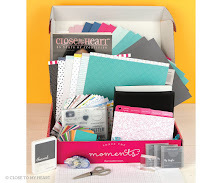 Or...you can sign up directly on my website and then anxiously await the arrival of this beautiful kit! I know it's easy to get caught up in all the worldly things surrounding Christmas - I do enjoy the lights and festivities - and am thankful I do pretty well not getting drawn into the crazy and negativity that's possible. I hope you are able to take a deep breath today and celebrate the joy of the holidays, consuming yourself in the moment. 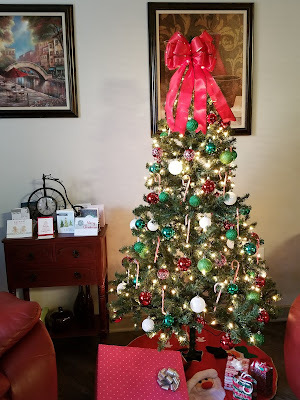 We have really enjoyed our Christmas tree, lights and holiday decorations this year. I don't know that I'll be ready to take them down when it's time to do so. One of the blessings in my life is as a Director for Close To My Heart. 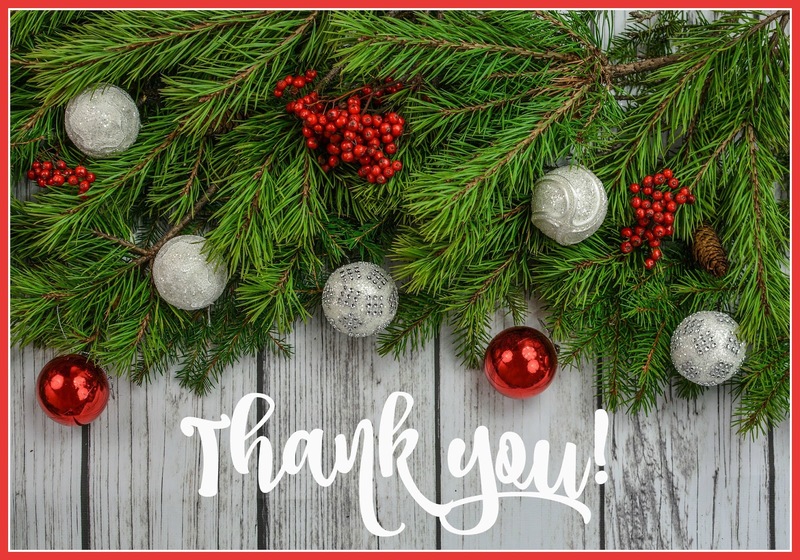 Thankful for everything in my life that encompasses CTMH - fellow Consultants, team members, customers, friends and family - we are well taken care of by the owner, Jeanette Lynton, and all of the home office staff. 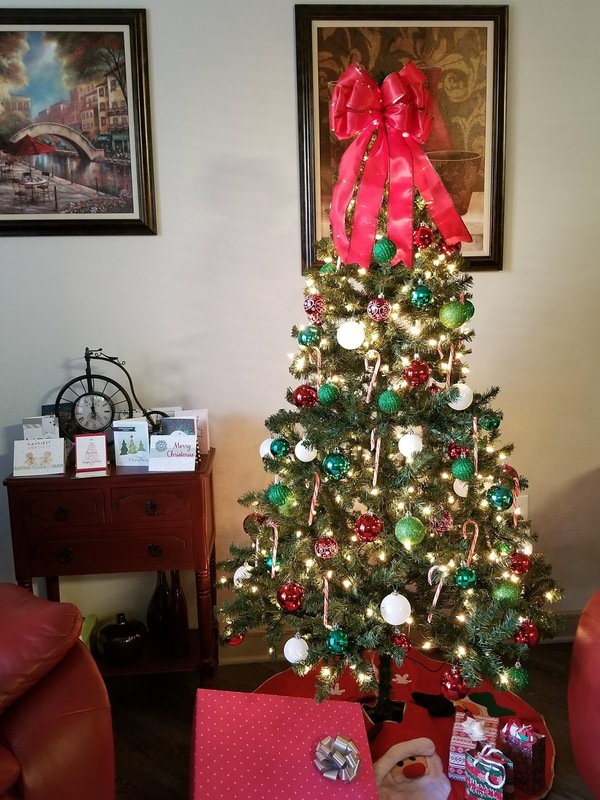 We enjoy various perks as a Director and one of them is receiving a Christmas gift each year. This is how the package arrived this year and included a beautiful handmade card, with a heartfelt message from Jeanette. It was a definite feel-good and before opening the gift...I drooled a bit over the wrapping paper (LOL); the look AND feel. :) (I'll share the gift soon but am being respectful of those Consultants who may have not already received theirs. This is a close-up of the card that was included. Isn't it beautiful?! I love everything about it and if I had received it sooner, I would have so copied it! LOL It may just serve as a Christmas card for next year, but regardless, it sure gives me some ideas for other greeting cards. I wish you a blessed and enjoyable day - whether surrounded by tons of people or a quiet day by yourself or with a few others. Whatever you do today, be sure to remember the reason for the season. Save 30-40% During Our Boxing Week Sale! 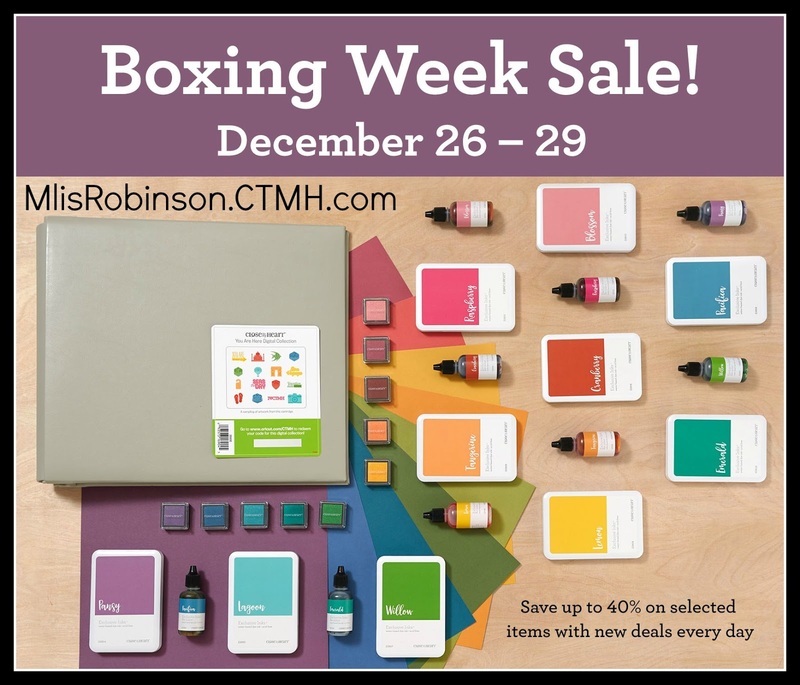 Just when you thought the holidays couldn’t get any better—we’ve got another seasonal sale planned: a Boxing Week Celebration featuring four days of savings! 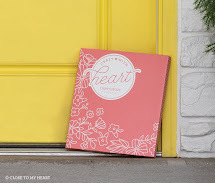 During this sale Close To My Heart will be offering daily deals on my website, featuring 30% savings on individual items and 40% savings on exclusive bundles of product they’ve put together just for this sale! They can’t tell us what specific items will be included quite yet, but they are current items! The fun starts at 12:00 am (MST) on Tuesday, December 26, and runs through 11:59 pm (MST) on Friday, December 29. 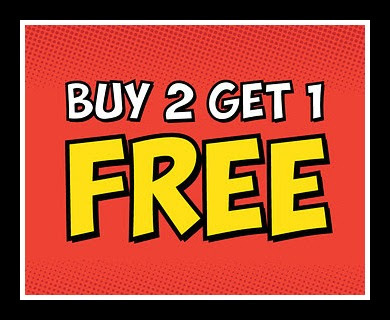 New offers will be posted at midnight each day and stay up until 11:59 pm on that same day, while supplies last. Sale prices are only available on orders placed through my website during these times. All discounted items ordered as part of this sale do count towards Stamp of the Month and Hostess Rewards qualifying order totals. As usual with discounted items, shipping and handling will be based on the full retail value of sale items. 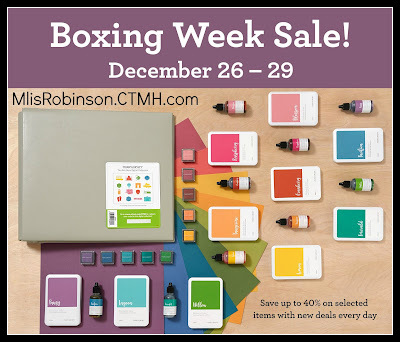 To see which items will be discounted during this sale, visit the Promotions Page on my website at any time during the sale—the Boxing Week items will be listed on that page. All the items included in the sale are only available while supplies last, and there is no grace period for placing orders—so be sure to place your orders before the sale ends! A reminder and direct link about this sale will be provided in my VIP group on the 26th. Join me there, if you aren't already a member. I would love to have you! Please share this information with anyone you think may be interested. I can't wait to see what they have to offer us! Contact me if you have any questions or if I can assist you with your shopping experience. I have seen these cards over the last few months and decided to give one a try to teach to my team members when we gathered earlier this month. Believe it or not...SUPER EASY! In fact, you can actually put something fun (and small) in the gift box. One of my team members suggested a beautiful ring! LOL I was simply thinking chocolate. Duh! I need to dream bigger! 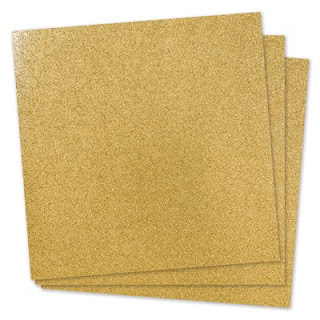 So what do you think you can do with this card since you [obviously] cannot put it in an envelope? It was suggested to place it on a desktop, beside table, etc. You can still write a greeting inside. 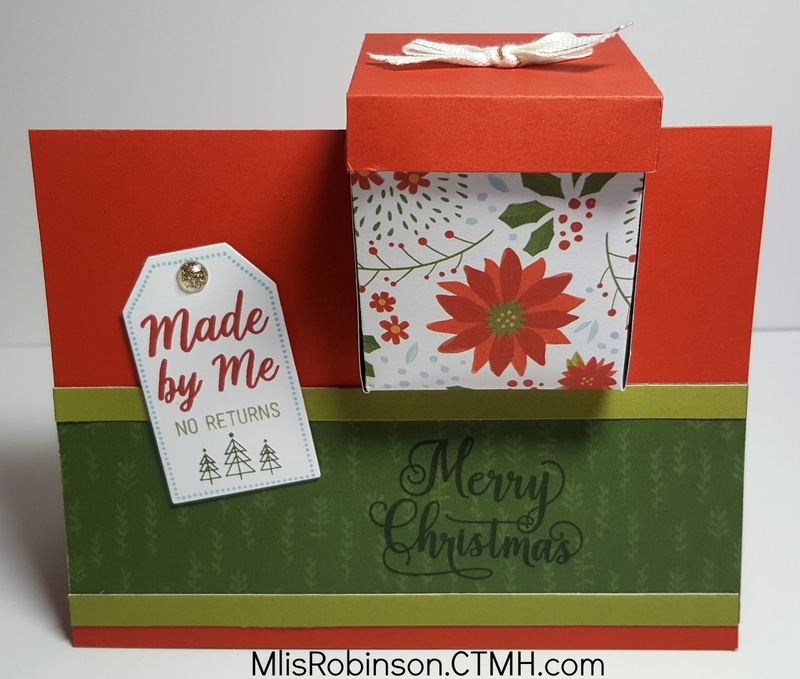 While I created this with Christmas in mind, you can totally switch out the paper and colors for birthdays and other holidays/occasions. This super fun stamp set, "Thought that Counts", will no longer be available after the end of this month (and is only available while supplies last). 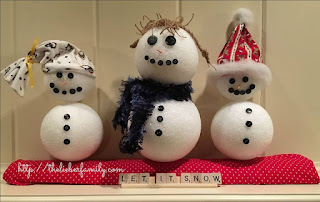 Check out the cute sentiments and while perfect for Christmas, there are many you can use throughout the year! Which is your favorite? The tag design in the stamp set coordinates with this set of Thin Cuts - Basic Tags. I used the one on the top left for these tags. You can use the 4 thin metal dies to quickly and easily cut the paper shapes shown in the photo. Size of the shapes: 2 1/2", 2", 1 1/2", 1". 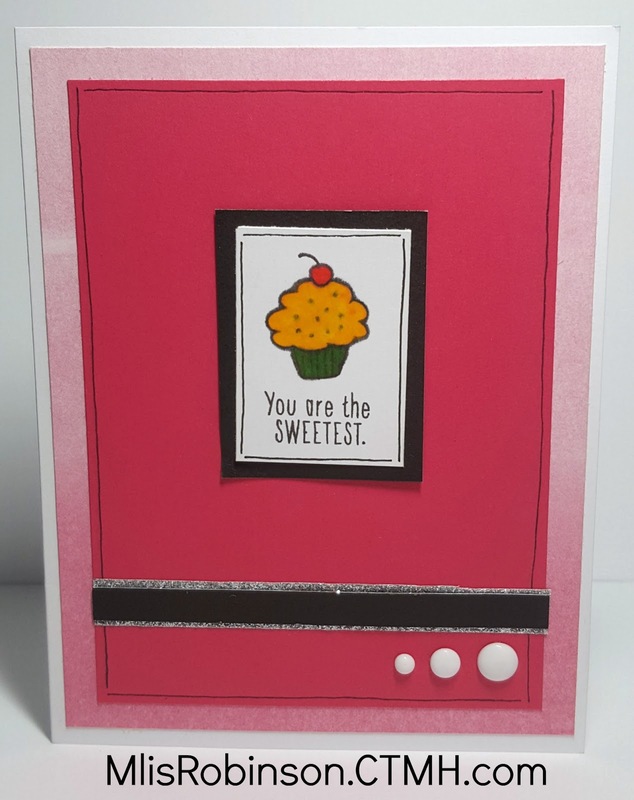 To create a card like this on your own, check out this great video I used to create mine. Feel free to contact me if you have questions and if you make one...please share it with me! I would love to see it! Only two days until Christmas and I'm totally excited! 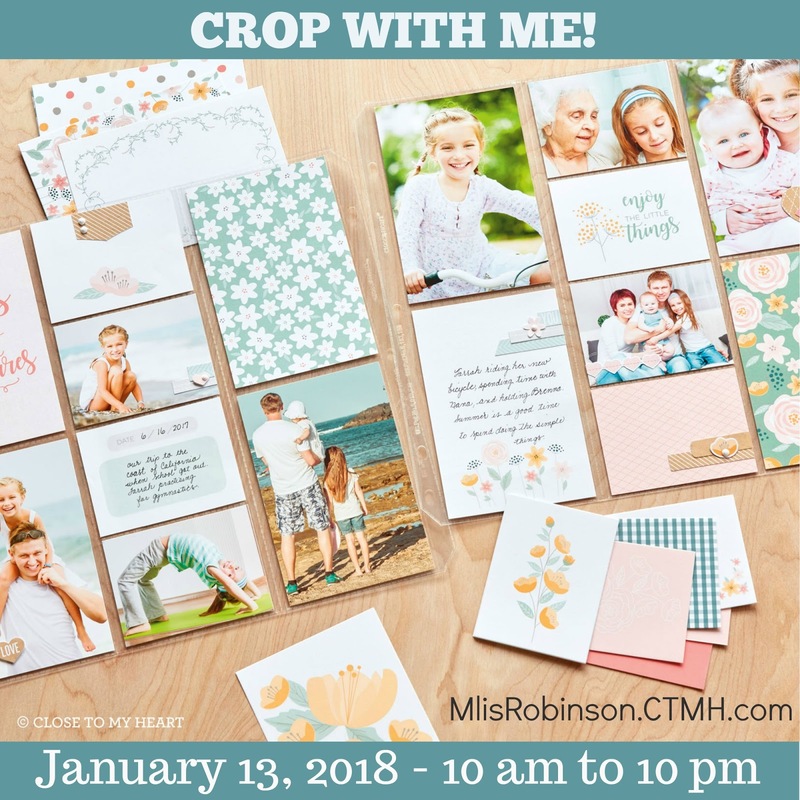 Let's Crop in the New Year! Let's get together and crop in downtown Irving. This is a no frills crop, hosted by the City of Irving, where we can gather together and meet new papercrafting friends. Bring your own projects to work on and a snack to share with all others who attend. You might consider packing a lunch/dinner - there is a refrigerator - or you can go pick up something nearby. Just a Little Bit of Pun! 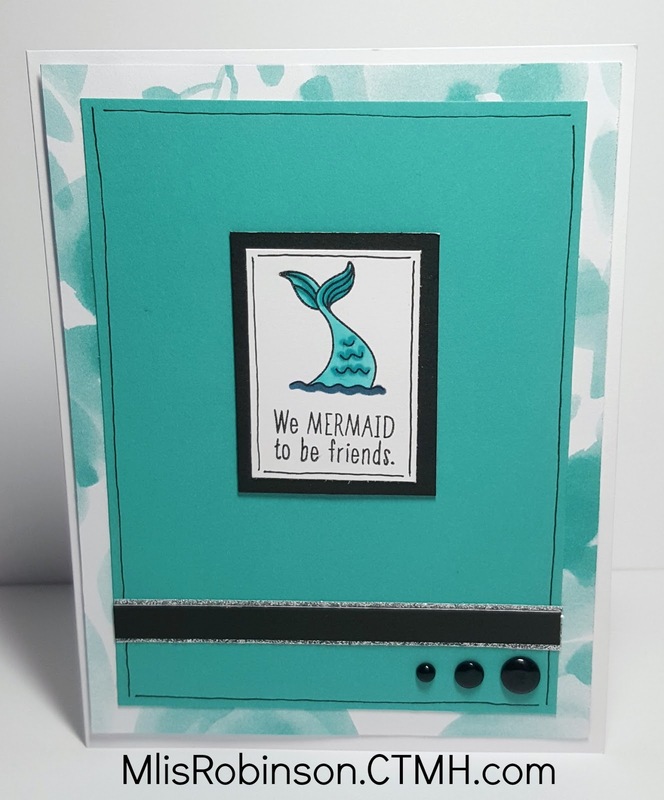 "We MERMAID to be friends." LOL For some reason I get tickled with puns and Close To My Heart hit a homerun with this adorable stamp set! Don't you agree?! 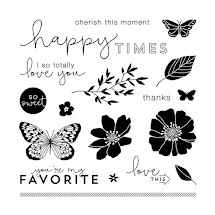 These fun little images are perfect for brightening someone's day or for providing them some cheer when they need it. It's only available through December 31, 2017 for $5, with a qualifying $50 order! Here is where you can find all the details or contact me. 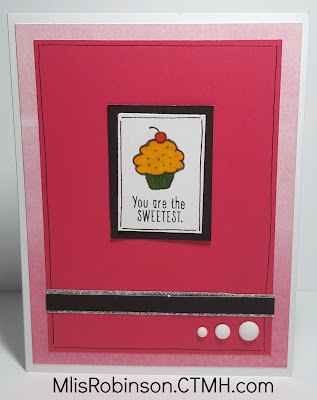 This sentiment is a little more obvious but I still love the adorable cupcake image. One can never go wrong with a cupcake! "I need S'MORE friends like you." "I like you a whole WATT." 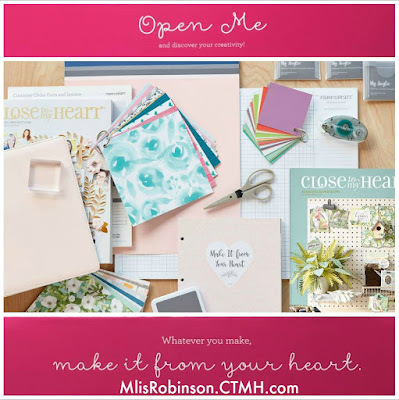 If you want a bit more inspiration, and some recipes to recreate cute items on your own, check out what the CTMH Art Department has shared with us! 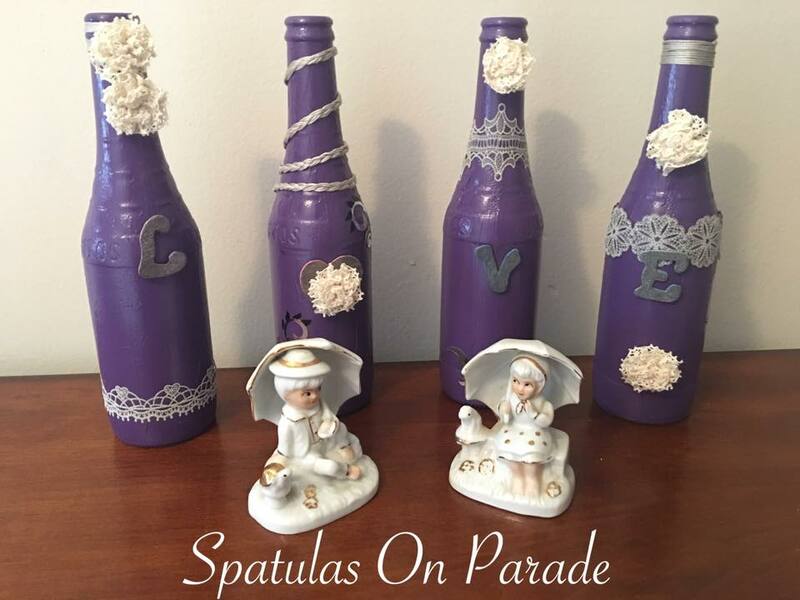 You can use them as a source of inspiration for your own projects, changing out the colors and products you use! CONTACT ME if you want to place an order while this stamp set is available! 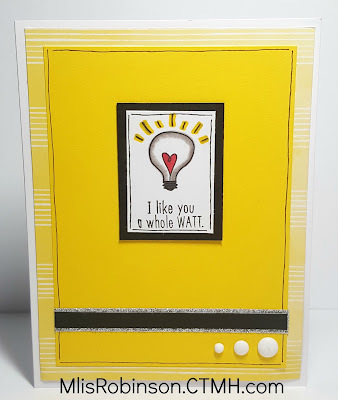 When you do, I'll mail you a handmade card with a fun sample. You can also place your order directly on my website. Be sure to select for the $5 stamp option when your order reaches $50. 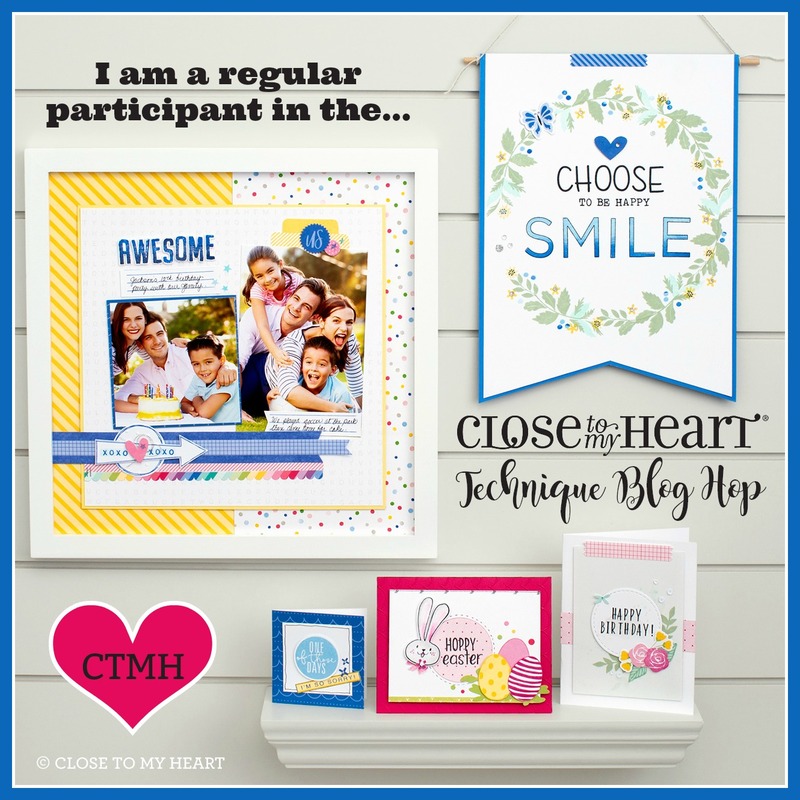 Thank you so much for joining us for this month's Technique Blog Hop where we feature Close To My Heart products and fun techniques to incorporate them. 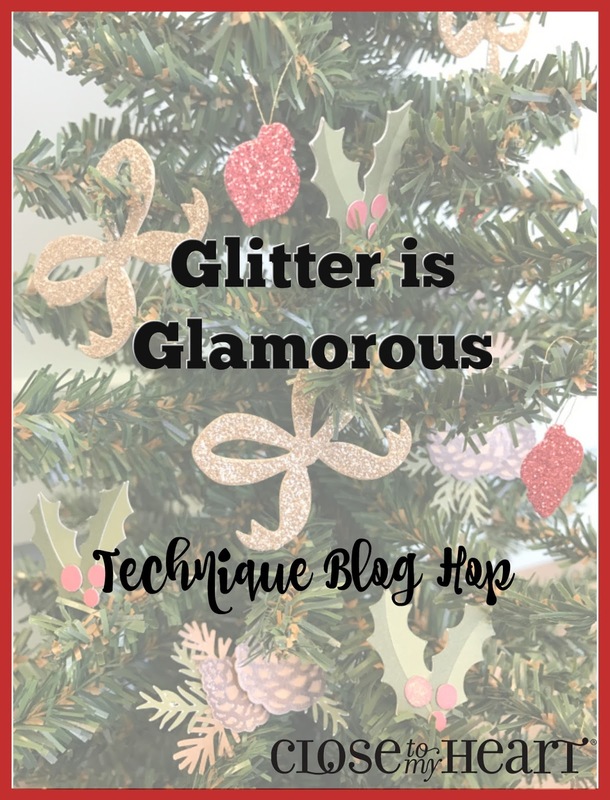 Today we are highlighting all things "glitter" which includes our Glitter Paper, Shimmer Trim, and Shimmer Brush. Each of these, as well as some other products, add that little bit of sparkle that is perfect for your artwork. 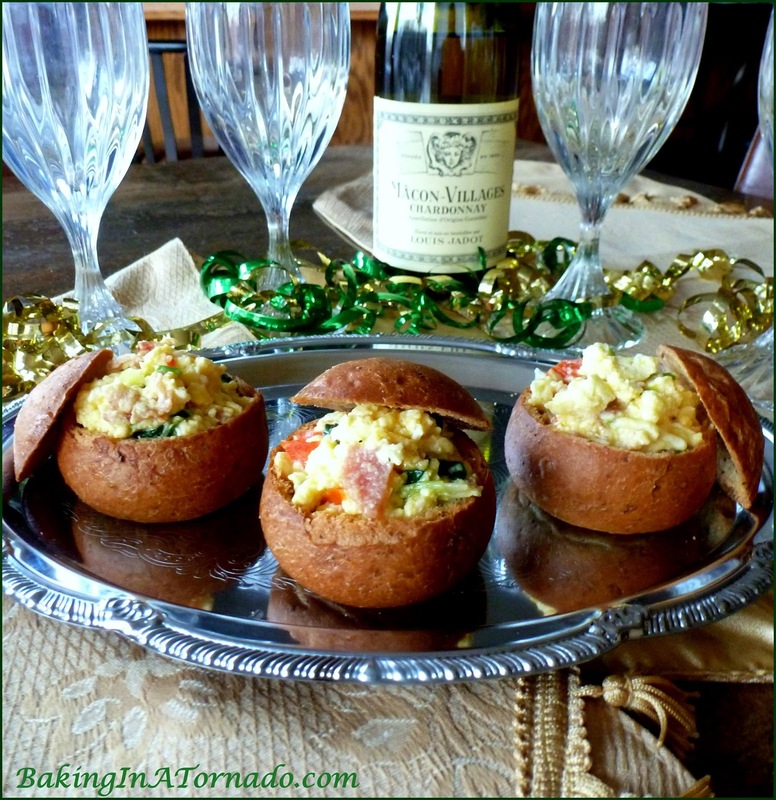 If you are coming from Judy Faye's Blog, you are on the right track. There is a complete list of participants listed at the bottom of this post should you get lost along the way. I didn't want to do a whole lot to these cards, wanting the focus to be on the puns that are the attraction of this adorable stamp set. While it needed a bit more, I didn't want anything to overpower the simple design so decided to use some Silver Shimmer Trim under the black strip of cardstock. I love how it's that little shimmer that does the trick. Now, head on over to Haley's Blog to see what artwork, and the other hoppers, have to share with you. It is hard to believe it's almost mid-December. 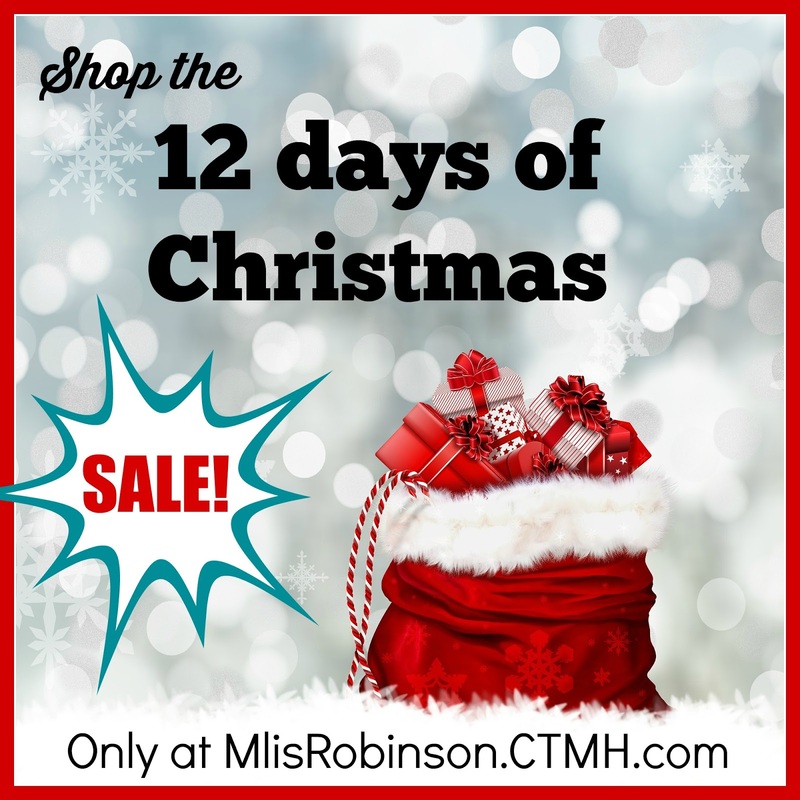 I hope you've enjoyed the 12 days of savings and that you've taken advantage of them, whether for you or a friend or loved one. It has been fun offering these specials to you and I truly appreciate your business. In fact, you still have time to purchase products. Scroll back through the 12 days and let me know if you want to add to your order. 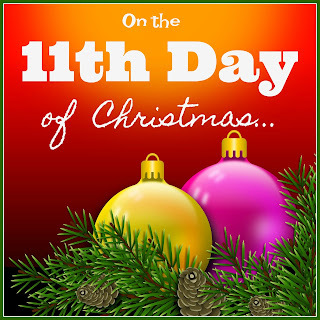 If you've participated in any of the 12 days of Christmas, I will contact you tomorrow with a final total and to make arrangements to collect payment. Full payment is due December 15, 2017 and the order will be placed on the 16th, to be delivered to your doorstep. The prize drawing, as disclosed in the initial details, will take place on December 16th. The winner will be announced in my VIP group. Please contact me with your questions. Purchase any three stamp sets of your choice and get ONE (of lesser value) FREE! 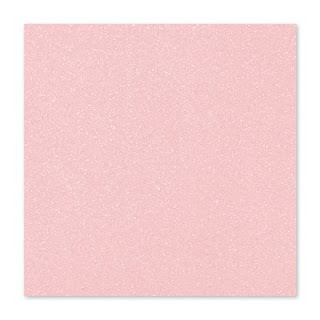 We have a variety of Stamp Sets to choose from, some which include coordinating Thin Cuts. 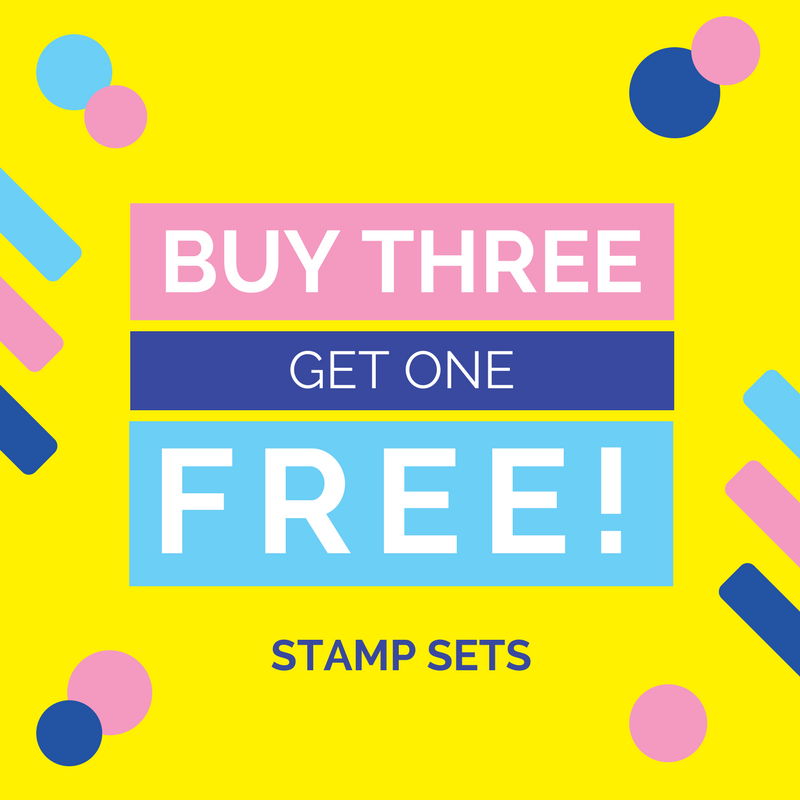 Message me with your list of three stamp sets. Contact me before 11:30 pm today (CST) to select this special and get two tickets into the drawing. To fully benefit from this 12 Days of Christmas offer, read up on the fun details posted HERE and contact me if you have questions. Have you check out our Glitter Paper? It comes in SIX colors. Each package contains 3 - 12" x 12" sheets, 1 color per pack. It is of quality weight (cardstock) and cuts nicely with the glitter remaining on the paper (and not ending up on everything else). 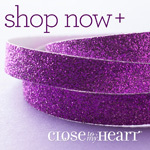 When you buy two packs this month, I'll give you one FREE (your choice of color)! Today I am joining with seven blogging friends to highlight some cool posts on our blogs centered around the theme, "Celebrate". 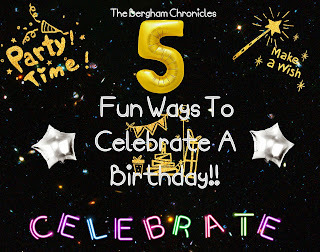 Each of us were able to interpret that theme how we chose and as it applies to our blogs. When you are finished reading my post, I encourage you to follow any and all links I have posted below - along with their representative image - to see what they have to share with you. Of course, we all appreciate hearing from you so please consider leaving comments for us. I am focusing on celebrating relationships through what I am sharing with you today. 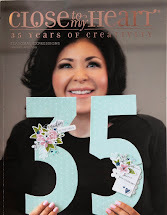 That is the primary reason I became interested in Close To My Heart, and creating handmade items, many years ago. I love being able to invest my heart - more than my money (ha!) - in giving small tokens of appreciation, thanks and love to friends and family members. It is the reason I continue to do what I do and love bringing a little bit of happy when I can. This little holiday treat box is an idea generated from my friend Sheri Rottler. We sell Ribbon Packs that come in a clear plastic box. 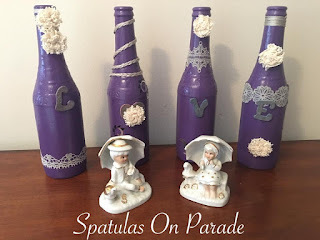 You can choose to throw them away OR you can use them for something cute like this! How fun, right?! 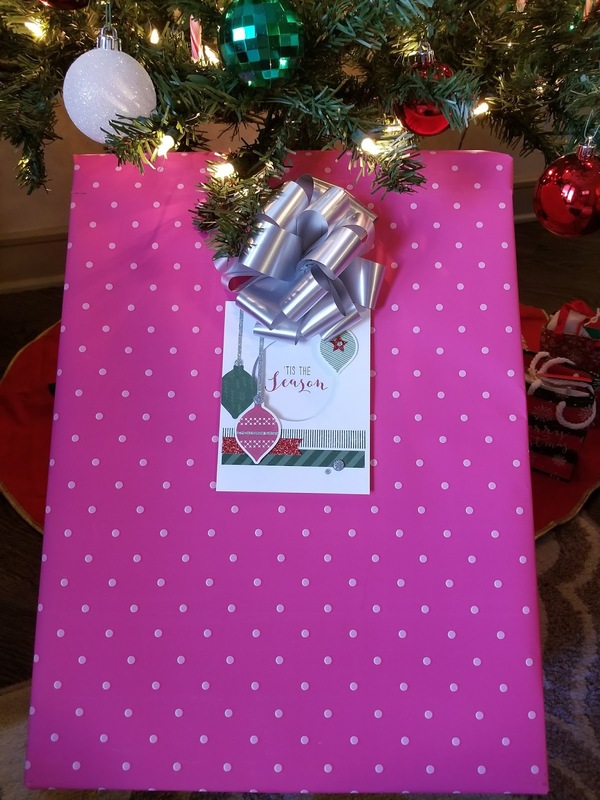 I glued a piece of patterned paper to the top, a piece of cardstock to the front and then decorated it with some cute stamp images and a beautiful gold bow (that comes in one of the ribbon packs). Fill it with chocolate...or some other holiday treat and you've got a C-U-T-E treat to give to someone special; so simple and cost effective! The most expensive thing here is the chocolate...worth every penny, wouldn't you agree?! Thank you so much for stopping by today. 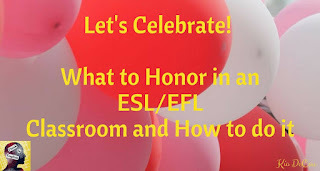 Please leave a comment, or let me know if you have any questions, and then check out my friend's blogs posted below. There's some fun things shared! Allow Me to Serve as Santa's Helper!